It is so easy to love Austria, with its hundreds of small towns nestled in the mountains or sitting in the open river valleys. It’s a photo-op extended to a whole country. Witness Feldkirch, capital of Vorarlberg, Austria’s westernmost province. 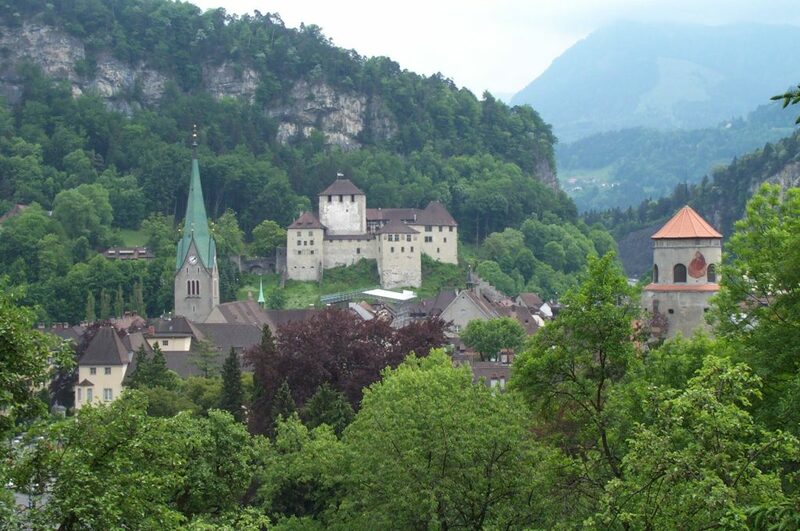 Feldkirch was built inside a very steep and rocky river valley where the Ill River passes out of the Alps and into the wide-open Rhein valley. It is almost completely surrounded by high cliffs and forests, providing wonderful views of the town. And the town itself is classic Austria-lovely — colorful, bright, and active. 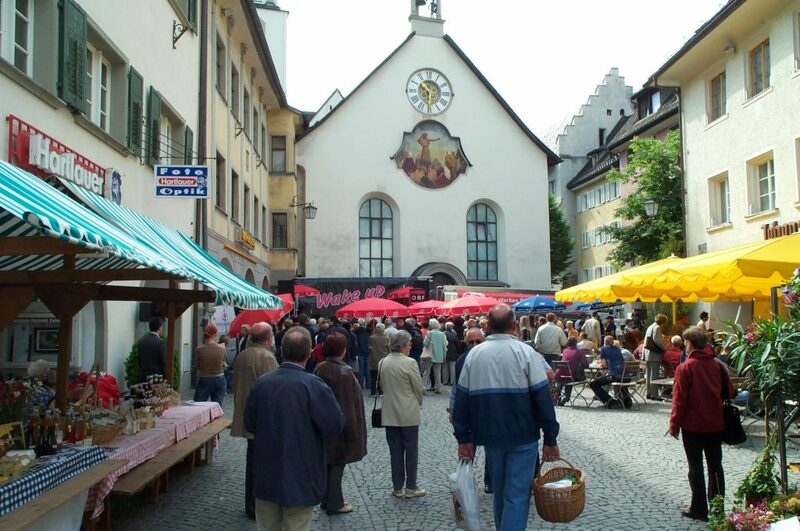 Much of Feldkirch’s old town is well-preserved despite a lot of modernization, and the city is a cultural goldmine — lively with music festivals, and youthful through a major local university. The first photograph above was taken from one of the surrounding cliffs, and it shows several landmarks from the old town. I describe them here from left to right. The green steeple marked the City Cathedral, a magnificent church that has been largely restored in recent years. Behind it is the Castle Schattenburg that houses the city’s Heimat Museum (Home Museum). I’ll describe Schattenburg much more later in this travelogue. The tower in the center of the photo is the Katzenturm, one of several towers from the old city wall still standing. The colors of the city are painted on the tower. Just beyond the Katzenturm is the white steeple of the Johanniskirche (Church of Saint John) that sat at the end of the market square. Finally, the massive yellow building at far right was the Landes Konveratorium (Conservatory) that was formerly a Jesuit University building. I had the opportunity to visit the downtown during a Saturday market, enhanced by some stage show put on by a regional radio station. The market took place in the main piazza, a narrow pedestrian district about two hundred yards long lined with beautiful architecture. The second photo shows one end of the piazza ending with the lovely Johanniskirche (Church of St. John). The red umbrellas marked where that radio stage shown and promotion was taking place, and the DJ’s voice echoed loudly over the square at times. Curiously enough, the hi-tech activities of the DJ were facing competition from a traditional troupe of Austrian dancers performing at the opposite end of the piazza. The troupe is shown in the photo above. 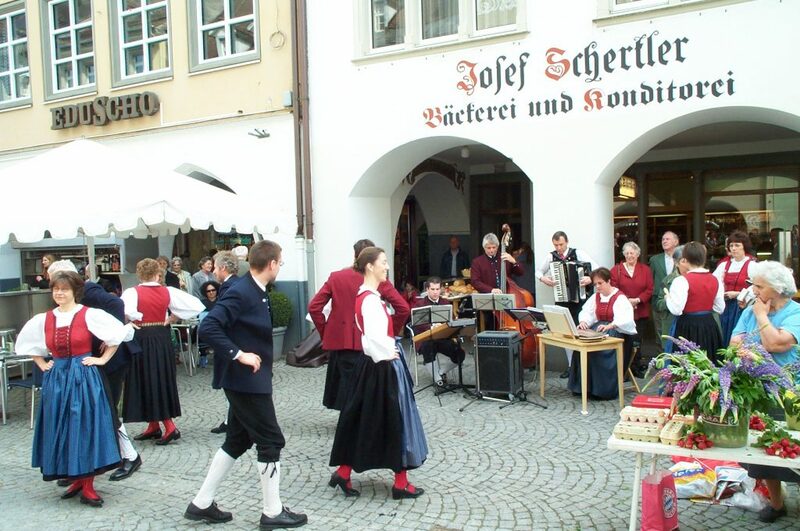 The simple costumes and lively orchestral music were similar to others that I had seen in performances elsewhere in Austria, and it was nice to see both seniors and young adults in the troupe — certainly keeping these traditions alive was a challenge in among the modern-day rock-n-roll loving youths that surrounded the DJ. Traversing the downtown, I really loved the artwork on the buildings everywhere. Along with the city’s colors proudly painted on the Katzenturm I previous mentioned, there was the sequence of murals on the sides of the Town Hall (Rathaus) in the fourth photo. 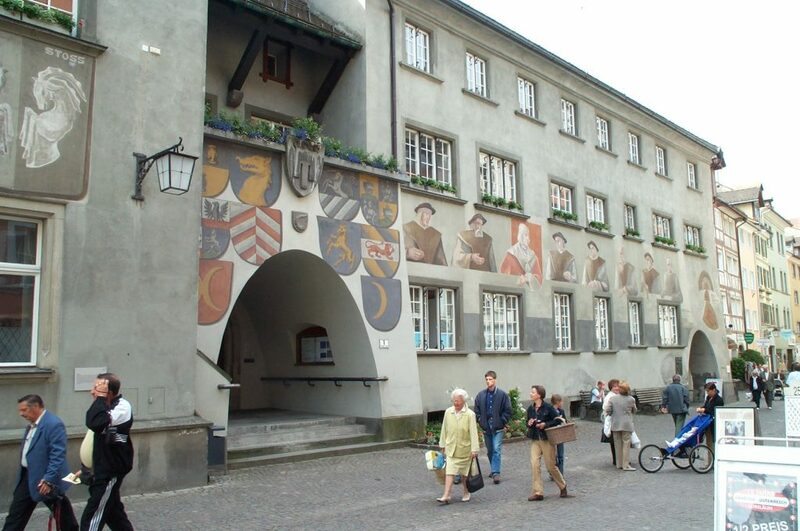 The murals included the crests of the cities and towns of Vorarlberg plus a collection of Feldkirch’s famous residents. Nearly all the guesthouses had murals of pub scenes or travelers on the front, intended to portray a warm, welcoming atmosphere. Feldkirch also hosted a lot of impressive architecture. Several provincial buildings on the Ill River were grand. For example, the Vorarlberg Finance Ministry that sat across the Ill from the Wasserturm, looked like a stately manor home but decorated with mosaics across the top. The Churertor (literally meaning gate towards Chur, Switzerland) was a classic Austrian gatehouse and tower decorated with murals. The local electric plant that harnessed the Ill River was also quite a sight (especially the rear of the building where the water was channeled in). The Castle Schattenburg, with its Heimat Museum, was a wonderful place to visit. The museum had two wings, a large wing taking visitors through reconstructions of the interiors of 17th and 18th century homes, and a small wing that served as a military museum. The latter was unique with one room dedicated to an important battle that occurred in Feldkirch during the Second Prussian War (1799-1802). An adjacent room had a tremendous display of old military awards from Bavaria, Austria, and Prussia, and a display of old coins, some that pre-dated the Austro-Hungarian empire. The views of the city were great as well, such as the fifth photo take I took of the Conservatory with a flower box in the foreground. The museum was not a bad deal for two-and-a-half Euro, plus the inner balcony had a very pretty café and restaurant available. I visited Feldkirch a week before its annual Spring Music Festival, and the Conservatory was busy with pre-festival events. I happened upon a drum recital being conducted by university students. It was hard for me to imagine drum solos done in a setting more appropriate for classical music, but the artsy crowd downing tea in the surrounding cafés seemed really into it. The last place I visited was the ridgeline from where I took the first photo. Several roads zigzagged up the ridge from the base of the Ill River, leading past the shell of some ancient churches and landmarks up to a wildlife farm at the top. This farm, called a “Wildpark” (meaning deer park), was a zoo filled with indigenous wild or domesticated animals — goats, deer, sheep, and boar. Artificial rock formations were constructed to give the mountain goats something to climb. As the sun came out in mid-afternoon, the Wildpark was filling up with families. The nice part of the Feldkirch layout, being so tightly wedged among two ridges and the Ill River, was that the city’s expansion was hidden away, out of sight and mind. It was in the wide expanse of the Rhein River Valley to the west where much of this expansion took place — complete with high-rise residential apartments and modern-day strip malls. While Feldkirch’s old town has grown, it’s been left largely alone, and I for one was greatful for that. As I said above, it is easy to love Austria. 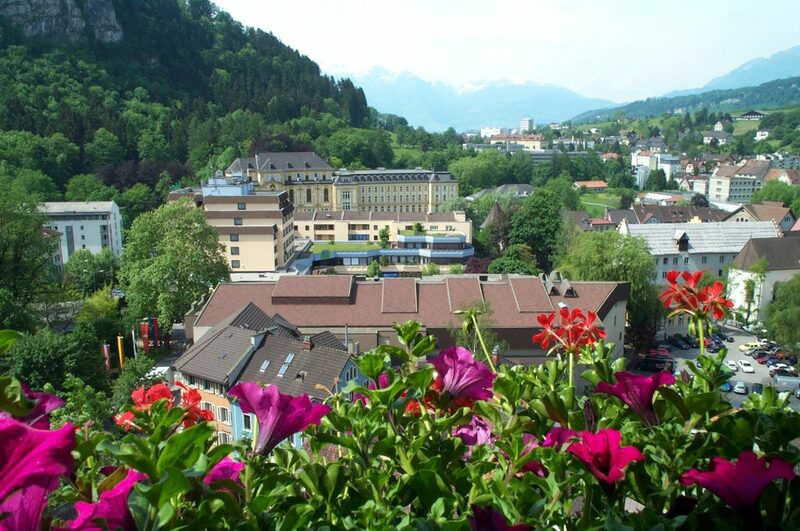 Feldkirch adds to my reasons why.